Two rounds of standing ovations and cheers filled the Lenape Regional High School District Board of Education meeting room on Dec. 21 for longtime-board member Joseph W. Borucki, who represents Evesham Township. Borucki, after 18 years, is stepping down from his roll on the board, as he chose not to run in the November election. Elected in April 1998, Borucki served as one of the two Evesham Township representatives on the BOE. During his tenure, he served as president, vice president and chairperson to various committees. Prior to serving on the LRHSD board, Borucki also served for two years on the board of the Evesham Township School District. 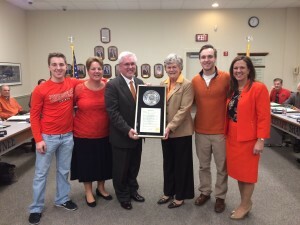 The BOE meeting was filled with the color orange for Borucki and Cherokee High School. Cherokee North Principal Donna Charlesworth, LRHSD Superintendent Carol Birnbohm and BOE President Linda Eckenhoff all spoke kind words of Borucki. Birnbohm, knowing his love of poetry, gave her speech in rhyme. Charlesworth gave Borucki a gift basket full of Cherokee pride on behalf of the high school, and Eckenhoff presented Borucki with a proclamation and plaque on behalf of the board. “Joe challenged, questioned or reaffirmed every recommendation, with the goal of making each the very best it could possibly be, for the betterment of our students, staff, programs and policies. On behalf of the entire LRHSD administration and staff, we extend our gratitude for his contributions in making our district one of the best places to go to school and to work,” Birnbohm said in a separate release. Newly elected LRHSD board member Bonnie Olt, who will be Borucki’s successor, thanked Borucki and expressed her wish to continue his legacy. “I know I have big shoes to fill. I promise you that I will continue your legacy … I look forward to working with the board,” Olt said. “I know Bonnie will bring passion, intelligence and new ideas that will keep our district moving forward. She has all of my best wishes and support as she takes on this remarkable opportunity,” Borucki said in the release. Borucki was thankful for all of the acknowledgements given by the community. He expressed his gratitude to family, school administration and colleagues, as expected, in rhyme. “It’s been my privilege to participate and do whatever small part, because, after 18 years, LRHSD has taken a piece of my heart,” Borucki said. Cherokee High School’s marching band students were recognized for their recent win in the 2016 USBands Group IVA New Jersey State Championship. The championship marks the band’s only first-place win in the last decade.